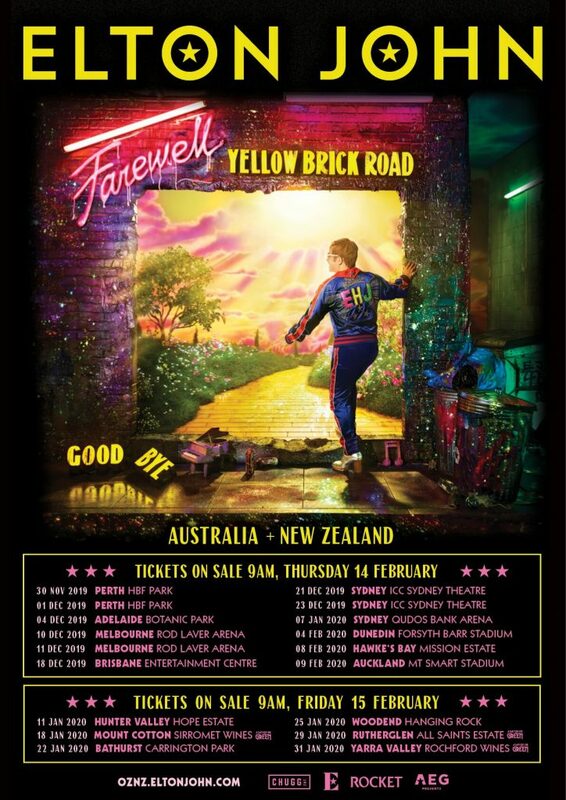 Sir Elton John, recently crowned by Billboard as the most successful performing male solo artist of all time, today reveals details of the epic 15-date Australian and 3-date New Zealand leg of his global Farewell Yellow Brick Road tour. 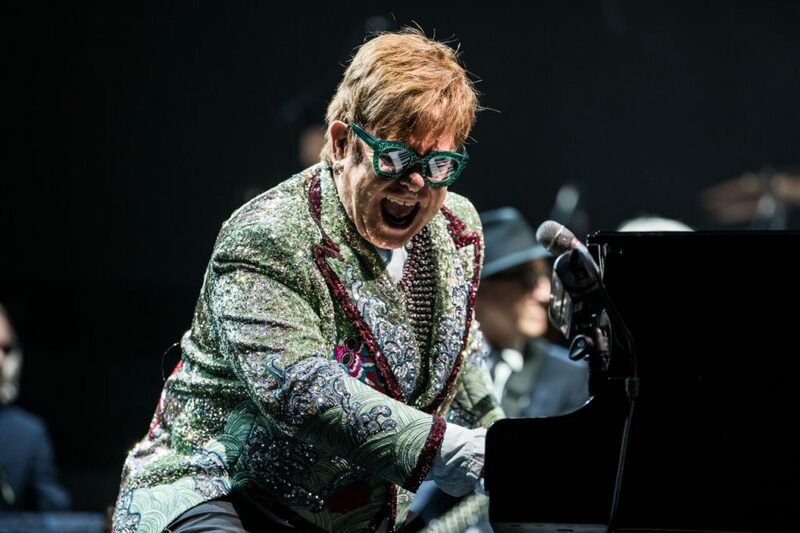 Between December 2019 and February 2020, Elton John will traverse Australia and New Zealand, in what will be the legendary music icon’s most extensive tour of the region to date. The tour will kick off with record breaking back-to-back appearances at Perth’s HBF Park (formerly nib Stadium) on Saturday 30th November and Sunday 1st December 2019, a huge 48 years on from his first ever Australian show, which took place at Perth’s Subiaco Oval on 17th October, 1971. Elton will deliver his famed songbook to spellbound audiences, on his very last tour, playing across a mammoth run that includes Capital City concerts, along with stops at some of Australia’s finest outdoor venues from the Hunter Valley’s Hope Estate to Rutherglen’s All Saints Estate, Rochford Wines in the Yarra Valley,Queensland’s Sirromet Wines, Victoria’s Hanging Rock and Bathurst’s Carrington Park, with additional dates, including North QLD, to be announced later in 2019. Beginning in Pennsylvania, USA in September 2018, Elton John’s three-year Farewell Yellow Brick Road global tour has already been hailed as one of his most“energetic, dazzlingly-original and joyful celebrations”. Elton’s legendary catalogue, including beloved songs ‘Bennie and the Jets’, ‘Rocket Man’, ‘Tiny Dancer’, ‘Crocodile Rock’, ‘Philadelphia Freedom’ and more, are showcased in a musical masterpiece that is a “reflective and stunning tribute to a great artist’s career” (NME), also celebrating his 50-plus year collaboration with lyricist Bernie Taupin – one of the great song-writing partnerships of all time. He will be joined by longstanding band members Nigel Olsson on drums (part of Elton’s original three-piece band in 1970), esteemed musical director DaveyJohnstone (who first recorded with Elton in 1971 and joined the band a year later) on guitar, virtuoso Ray Cooper on percussion, Matt Bissonette on bass, John Mahon on percussion, and Kim Bullard on keyboards. Sir Elton John said, “I always love coming back to Australia. Ever since my first visit in 1971 it has held a very special place in my heart.” Elton’s enduring history with Australia is evident across the years, notably in 2012, when he opened the Perth Arena, and most recently delivering the final performance at the Sydney Entertainment Centre [since demolished], in December 2015.